Sound familiar? Chances are, it’s not just in your head. First of all, online advertising options are getting more expensive. Over time, there will be more and more businesses on the web, making it a more a more competitive environment. More competition will lead to an increase in advertising, and the more businesses advertising will raise the prices of that advertising. What you should be really looking at, then, is how one channel compares to the rest of the places you’re advertising. 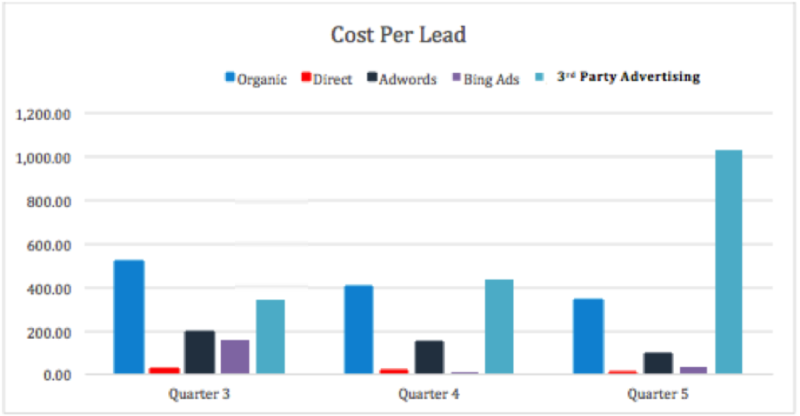 Take, for example, this graph of a client’s Cost Per Lead over the past three quarters. Over time, the 3rd party advertising (light blue column farthest to the right) is getting more and more expensive. This last quarter it nearly tripled it’s next closest competitors Cost Per Lead. As their VP of Marketing, it’s our job to analyze the cost per lead and client of their various advertising channels, and advise them on how to make the most cost effective decisions. This trend in lead costs isn’t atypical – traffic to sites, competitiveness of a market, Google algorithm changes and more all can have large impacts on the ability of an online channel to succeed. Stay on top of your advertising investments with a detailed analysis no less than once a quarter. In this case, the data seems to paint a pretty clear picture to discontinue advertising with that channel. However, this won’t always be the case – even if one advertising channel is more expensive than the rest. To decide whether to continue advertising, focus on what matters. If you were to put that money somewhere else, would you get a better return on your investment? A final note: focusing on cost per lead (especially for law firms) can be a misleading metric for measuring the efficacy of a specific marketing channel. Some advertising channels are notoriously used as a lead list for ad sales people. Without digging deeper into the quality of each call, you can erroneously see a low cost per lead for a specific advertising channel caused by lots of phone calls… from advertising channel sales people. Cost per lead can be a good starting point, but it’s absolutely essential to take the next step and calculate the actual cost per client by marketing channel. Thank you for the proposals and the case study. All of your hard work is much appreciated yet I also have one more suggestion. By optimizing you can create a balance between your expenses and ROI. In fact, by employing optimization, you can even gain better ROI compared to the advertising.